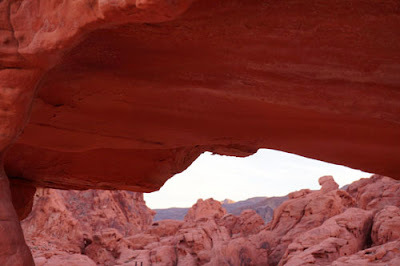 Valley of Fire, the oldest Nevada State Park, is located in the Mojave Desert approximately 58 miles or about one hour from Las Vegas. Among many interesting rock formations are Elephant Rock, Arc Rock, Beehives and among endless beautiful trails is the Mouse's Tank. 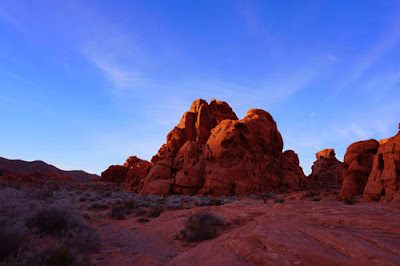 Trail head is a little over a 1 mile drive behind the Valley of Fire Visitors Center and it is a relatively easy 1 mile hike through an amazing landscaping. The hike elevation gain is 240 feet. Mouse's Tank, known officially as Petroglyph Canyon, is surrounded by mystery and legends. One of the legends is about its very name. It's said this remote reservoir was the hideout of Mouse, a fugitive Paiute Indian, during the 1890s. He was accused of gunning down two miners and also some other crimes in the area. It's said he went wild on a few occasions when he got drunk. The word "tank" comes from cowboy lingo, where a "tank" is a place that holds water. 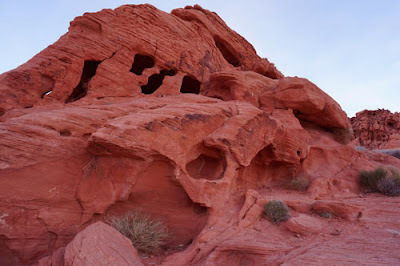 Follows a sandy wash from the potholes in the sandstone rock, down a waterfall, that I wasn't able to see, I guess it evaporates during the summer, you arrive at the Petroglyph Canyon. The rock walls at the base of certain sandstone monoliths are thought to have been decorated by prehistoric ancestral Puebloan farmers or not. Before reaching the Visitor Center, turn left and drive west on the road to Mouse's Tank and the White Domes. The Mouse's Tank parking area is just a few minutes up the road. From the trail head, it is about 0.25 miles to the heart of the petroglyph area. Entrance Fee: $6.00 per vehicle per day; $60.00 for annual pass. Camping Fees: 14.00 per night per vehicle. The park is always open. The visitor center (open daily, 8:30 AM to 4:30 PM) provides exhibits on the geology, ecology, prehistory, and recent history of the park.